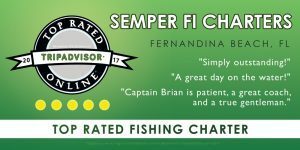 This past week while inshore fishing Fernandina Beach, we have had quite a variety of fish being caught. The mullet run is in full swing. We have gotten out early in the morning and have had a fantastic topwater bite for Jack Crevalle and Lady Fish. Both these fish are hard fighters on light tackle. We found these fish crashing schools of bait in about 5 feet of water. The rods were equipped with 4 inches Skitter walk topwater baits. My clients would see the fish chasing the bait schools and throw the baits into the melee and start working the bait back. These fish would explode on the bait, sometimes missing the first time and coming back a second and third time until getting hooked. Then the fight would be on inshore fishing Fernandina Beach. These fish averaged three to five pounds. Every now and then a nice speckled trout would be caught. 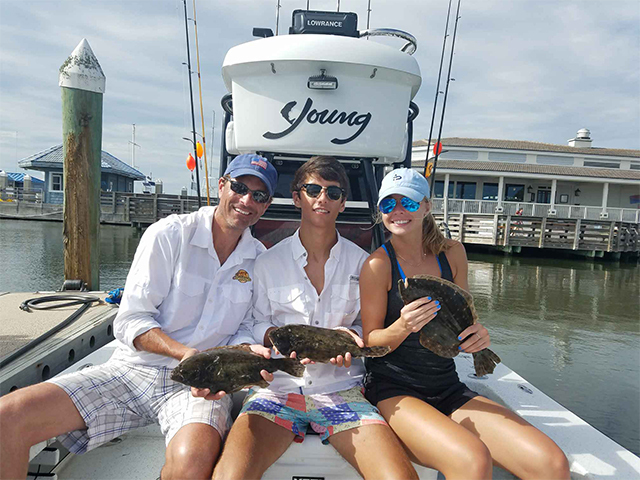 The flounder have still been biting great with a lot of nice 16 to 18-inch fish being brought in. The tactic used was floating a mud minnow or small mullet along the grass edge with the tide flow. You had to be patient letting the fish pull the cork down and giving it time to swallow the bait. Once you felt he was on you would reel in the slack line and set the hook. A lot of nice Mangrove Snapper have been being caught. These are also hard fighting fish for their size and great on the dinner table. There have been plenty of small redfish around with one in the slot being caught every once in a while. Overall it has been a good bite.